We were brought up (as were the majority of you lovely people, we’re sure) to keep schtum when you’ve got nothing nice to say. 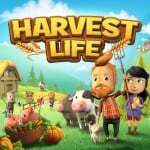 Unfortunately, this review would be over almost as soon as it had begun, so we’re going to dig deep to find some drops of positivity in farm sim Harvest Life. It’s not egregiously terrible – it’s just not very good in any way at all. You know Harvest Moon? It’s like an early 3D prototype of that. Very early. First impressions aren’t good. The horse-and-cart that delivers you across the sleepy town of Lohwold jerks awkwardly and the camera hitches. Arriving late at the farmhouse, grandpa sends you immediately to bed. Tiredness is an ever-depleting meter which must be charged through sleep; ignoring it means collapsing from exhaustion where you stand while it replenishes. Time speeds up as you slumber, but it’s a frustrating mechanic to have to keep in mind. Waking up with ‘Y’ immediately ‘teleports’ you to the centre of the cabin, showcasing the game’s rudimentary animation. 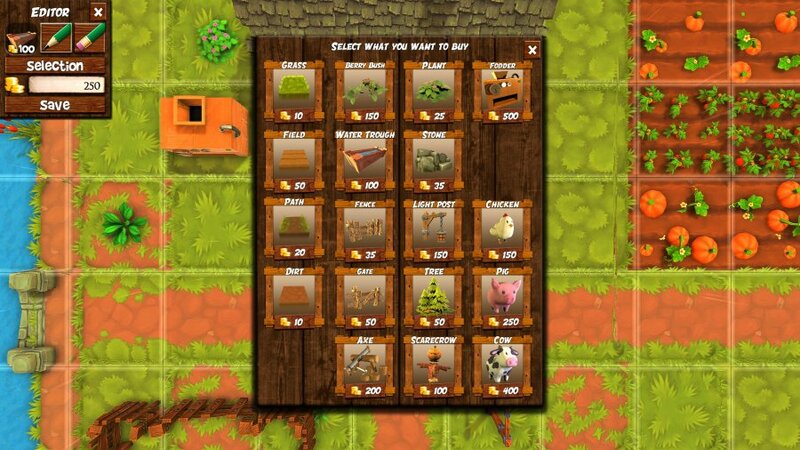 Later, you’ll be able to customise the landscape, add buildings and employ helpers from the desks in your farmhouse, but that requires coin – for now, it’s off to work with you. A progress report flashes up at the start of every new day and working your ugly square plots will result in a large stock of veg to be sold or eaten. Hunger is another meter to monitor, unless you want to be warped home and informed you splurged on a takeaway. Controls are simple: ‘A’ and ‘B’ are used for context-sensitive actions with your limited inventory items assigned to the D-buttons. Holding ‘R’ activates a slightly faster run – you may as well tape it down. 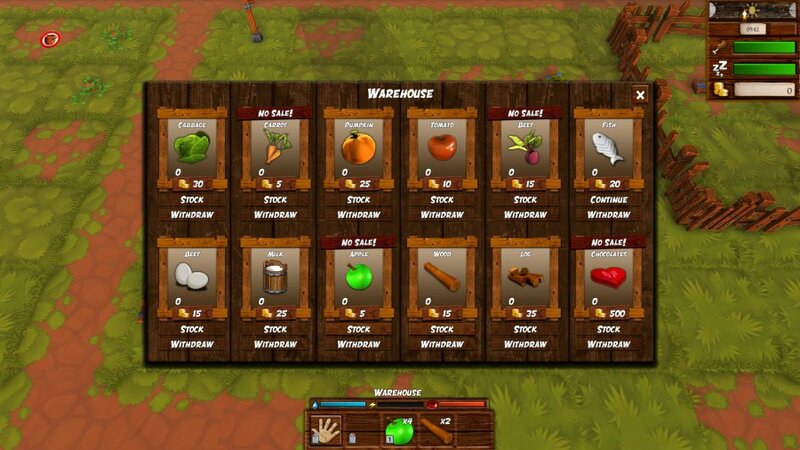 As the clock ticks, a checklist of tasks introduces various mechanics, including feeding your livestock, fishing and chopping wood. The latter is a Fruit Ninja-style minigame where you slice logs, while fishing involves keeping a green bar under a fish that moves along a larger blue bar until another green bar fills. It’s better than it sounds, but not much. 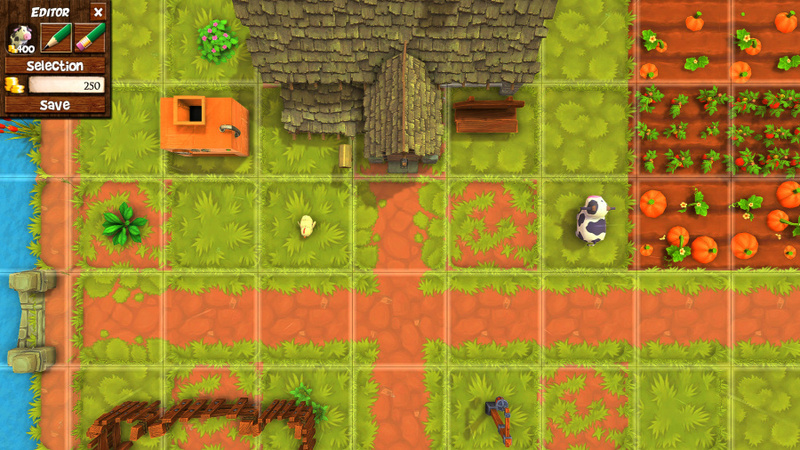 The mismatching textures of the town, woodland and river tiles are home to animals waiting to be mischievously renamed. A minigame-operated generator powers the ‘Fodder-Production-Machine’ which churns out vegetable chum for your livestock (which they promptly turn into ‘turds’, as gramps calls them), but a lack of animation or satisfying feedback seriously hampers your motivation to toil in the fields. It’s all so nakedly mechanical – make the electricity meter go up, pump vegetable units into the system, transform those values into food units which top up your fodder meter. Yes, we know games are all just numbers but developer bumblebee does a poor job obscuring that fact and you feel like an accountant managing bars and stats, flushing away any pastoral charm. But positives – positives! Well, there’s a host of language options. Menus include touchscreen support and function adequately provided you’ve got exceptionally small hands. Your knock-off Animal Crossing avatar’s movement animation is smooth-ish, so long as you don’t snag on the superglue-coated scenery. Fortunately, NPCs don’t have collision and you simply jog right through them. Items can be upgraded in town and you’ll find a few different shops and amenities, although working out which houses you can enter involves trial-and-error. Confusion reigns in other areas, too – twice our screen froze and cut to an eerie area with marauding wolves. Catching us off-guard, we thought we’d entered some sort of Lynchian dreamscape brought on by ignoring our sleep gauge; weird, but our interest was piqued. Only the third time did we realise we’d pressed ‘A’ next to an innocuous tile (looking much like the surrounding tiles of recently-felled trees) and stumbled into a spooky woodland area. Poor signalling isn’t the worst of it; performance is patchy. The framerate chugs from the very start and our Switch’s fan was going gangbusters. We could go on about the tiny text or the frozen screens or the awkward UI or how it’s easy to get lost or how the day/night cycle feels too fast, but on a positive note, the music is pleasant. It’s banjo-filled bumpkin fare – easily the best thing about the game – although it soon palls through repetition. A trip to the catacombs to find a lost dog offers respite and a different tune, but the skeletons you encounter inflict damage without any visible contact and your health gauge plummets. The result of all these constantly depleting meters? Harvest Life feels like a pestering mobile clicker and not relaxing in the slightest. Firing up another pair of Joy-Con enables a friend to set up home in the northern forest and you can work together via split screen. Tedium shared is tedium halved, and simple interaction has you imagining you’re on the cusp of ‘fun’ until your guy falls asleep because you’ve forgotten about the stupid ZZZ meter and a shared world can’t be sped up. Cue snoozing on the cobbles as the sleep bar fills. Slowly. Harvest Life is not irredeemably awful, but it’s rough and easily outclassed by the games it evokes. It feels dehydrated, with all the soul and polish sucked out, and a few pleasant tunes aren’t enough revive it. Games of this ilk thrive on charm; this is subsisting on numbers and fodder. Harvest Moon fans don’t have much on Switch at the moment beyond Stardew Valley, but life’s too short to waste in Lohwold. Those graphics look like a Play-Doh advert on a dodgy kids TV channel. Ouch! Sounds like a painful farming simulator ..
Kinda figured. Ok back to stardew until story of seasons devs grace us with a game. I'm kind of impressed that they managed to make a Harvest Moon-like game that's somehow even worse than the recent Harvest Moon games. Unfortunately, this doesn't sound like a good substitute. Saw that coming. It's Story Of Seasons or nothing else for me. This was one for the Nindies Round Up. A "Thumbs down" one. I knew this game would be terrible from the first time I saw those wretchedly bland character portraits. Back to Pelican Town we go, until a Story of Seasons or Rune Factory hits the Switch. Ouch. I’ve listened to Death Metal less savage than this review. A shame because I was intrigued by couch co-op in a farming game but won’t be picking this up. Oh, well. There will be My Time at Portia, Re:Legend, Farm Folks for Nintendo Switch. I’m not saying developers shouldn’t try, but it’s hard to imagine a better Harvest Moon style game than Stardew Valley. Eric Barone has also been so generous with updates and open with receiving input from fans. I already knew this was bad, so nothing new there. I don't think they're wrong in claiming that a Harvest Moon fan doesn't have much outside of Stardew Valley, as I find it hard to imagine many fans getting much enjoyment out of the abomination that goes by the Harvest Moon name these days. Whelp, those that were tired of NL handing out 8/10's, hope this changes things up a tad! @BenAV I'm sorry, but I am a Harvest Moon fan, and I enjoyed Light of Hope just fine. So did other people. I know it's cool to hate on the Natsume games, but to pretend they don't exist is just petty. It's way cheaper on PC though. Same for this other game, not that I'd actually recommend getting it at all, but I have no idea why would they sell this for 30 dollars on console when it's like 5 on PC. I agree with the notion it’s popular to hate on Harvest Moon nowadays. While I haven’t played Light of Hope on Switch (yet), I have played the Story of Seasons games on 3DS. When Stardew Valley came out on Switch lots of people dissed the newer Harvest Moon games. IMO, both Story of Seasons games are better than Stardew Valley. It’s just that few tried them. I like Stardew Valley, I just don’t think it’s as great as most others. Harvest Moon Light Of Hope (granted I was told isn't a harvest moon game) is still a fantastic title, and in my opinion, the same but a little better than stardew valley! And with both of them, they make for some great farming-simulation titles on the Switch (unless you want to go realistic with Farming Simulator). Other than that, I'm not sure why Light of Hope isn't a favorite with nintendo fans...it is a fun and great title and as I said...the same thing as Stardew Valley except with better graphics, visuals and a story. @JasonLee99 It's actually a really fun game. I own it on PS4, so I haven't played it on Switch (granted I'm sure they didn't change much if anything). 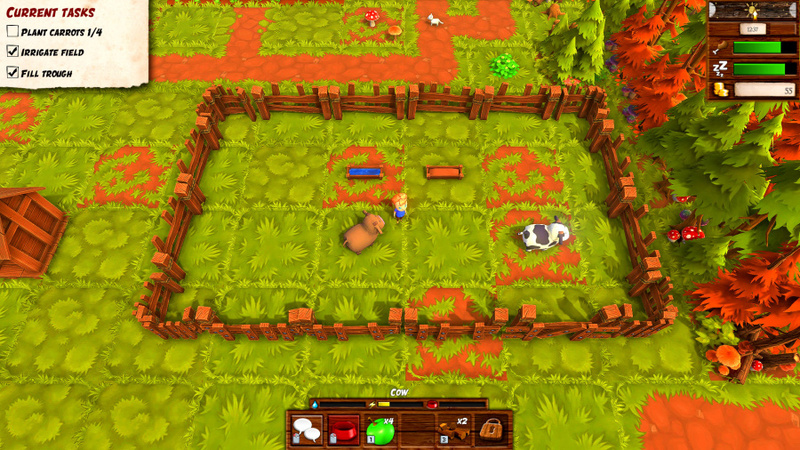 It plays just like stardew valley, except there is a lot more to do, more characters and just more to explore. Definitely a title you'd like if you enjoyed Stardew Valley or even Story Of Seasons. But, just like you, I don't get why people push it away. It's actually a good seller on PS4, but Switch owners have shunned it away for some reason. @JLPick It’s on my wishlist, just haven’t got to it yet. I’ve played tons of Harvest Moon, Story of Seasons, Rune Factory games over the years. I like most of them! Ouch! I usually eat up any farm sim I can get my grubby little mitts on, but this is a definite NO THANK YOU, SIR. Looks like I’ll be investing in Cattails instead! Half the price and more than twice the review score. @JasonLee99 It's not entirely made up, though. I have played and enjoyed a lot of Harvest Moon games, including later ones, as well as Story of Seasons and Rune Factory - and while most of them are pretty fun I think Stardew Valley is one of the best. It shamelessly does Harvest Moon right. I'm not saying everybody has to feel the same way. But my kids and I have absolutely loved Stardew. My eldest, who has played almost every HM/SOS/RF game available on Nintendo hardware (and still loves the latest ones), is on something like her fifth playthrough of it now. @JasmineDragon That’s fine. I just know that a lot of people I listen to on podcasts were over the moon for Stardew for ‘doing Harvest Moon right’. They would then admit to not having played any for 10-15 years. Their opinions were based on this shared assumption that Harvest Moon games are now all bad. I played 80 hours of Stardew on Switch. I obviously liked it but it wasn’t near as deep as the HM games imo. Plus it just felt generic to me. waist of time reviewing tripe like this imo.